I got to the house and there was an area cleared for me to build up the gate. Tools first, my little car was full of all types of things I may need.. The next thing to do was clear a bit more space and start dismantling the old gate. 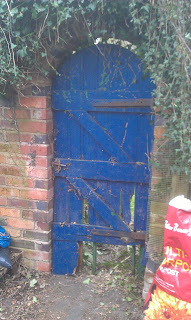 The strap hinges were lovely, a fair bit of wear on them, but still more than adequate for the size of gate that they were going to support. I got to work on removing the hinges from the old gate and was pleasantly surprised that the screws came out quite well, no chewed up slots helped and the rust from screw to hinge didn't slow it down either. In a short time the gate was off and lent against the wall. So, in a previous posting I had mentioned an Oak staircase with quite a few watermarks. The staircase was salvaged and reused in this home, and when you look at it carefully you can see where some jointing has taken place to make it fit. The watermarks were made when someone had left a bucket of water on the treads whilst doing some work on the walls. There were around eight or nine of the marks, some so bad that when they were gone I noticed some more on the same tread that none of us had seen. and after removal Another before.. and after.. and the worst one.. you can really see the shape of the bucket, this was easily the worst watermark I've seen... This is after, but I still hadn't finished. Busy doing all sorts, a late night last night. I had my first evening class, a good night all went well, a good lesson for me. I've added some better photos to the Gallery and putsoldon one of the first pieces sold from the Gallery. Have I mentioned a surf board coffee table, well it's cramped up, early days yet, but will be on here in the next few days.. This piece started off on the floor of the workshop, just under the crosscut saw. I had just finished the build of the student bench, the top was clean and clear. I was thinking about going home, started the usual tidy up, clearing around the saws, up the corner of the shop and was picking up these offcuts, bin or...what.. The wall space up the corner was crying out for something, it's just a plain white wall. And these offcuts are just beautiful, there are numbers on the ends of some, these were sorted into lengths and I used a black marker pen to note the usable lengths of each piece. Grey colour, from being outside at home under the temporary workshop ( remember that? ), some of the pieces still had evidence of the glue and plywood left from when it was staging, building platforms between the boats. A rusty old nail sticking out of one, a screw head in another and the timber yards red painted sort code, evidence of plenty of different uses.